This is what my bar looks like. I couldn’t find an actual bar that I really liked, plus they all looked kind of lame and didn’t fit in our great room. I had been begging for one for ages, and J and I finally agreed on this sideboard from Dania. It works well because I just keep everything on top, and use the cabinets for extra dishes and cookbooks. However, you can use anything. In my old studio apartment I used a cool wine rack/cart (similar) that I got off craigslist for $20. You could also use a shelf in your kitchen, the counter top, and old dresser- anything! This is a basic starter kit idea. You’ll need glasses of some sort. I’ve seen cool glasses at the Dollar Store for $.50 each. The most important are rocks glasses, shot glasses, and martini glasses (add wine glasses if you drink wine). I added a shaker because they are so useful for so many drinks, a wine/bottle opener for obvious reasons, and straws. Having straws takes your drinks up a notch! 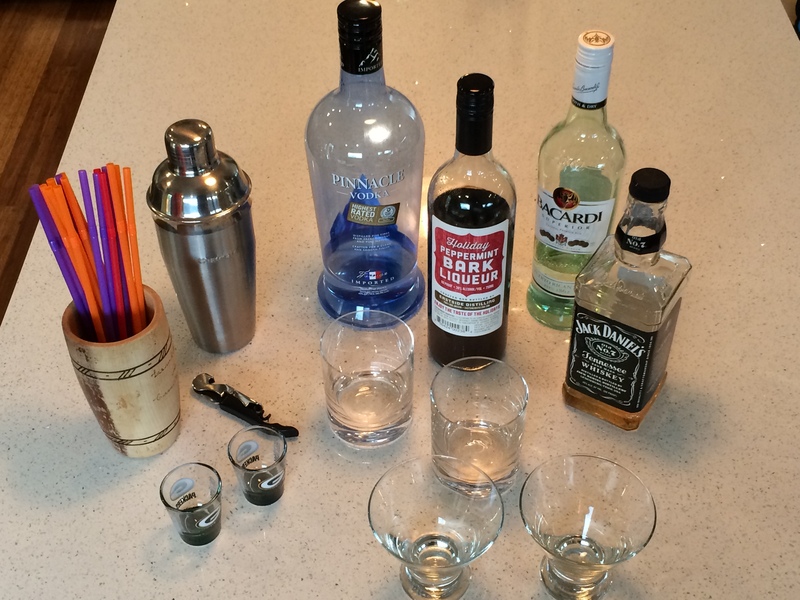 Pictured here are vodka, light rum, whiskey, and a specialty liquour. Start with what you like to drink, and then expand by watching what your friends drink or what looks cool on drink menus. With vodka, rum, and whiskey you can make a lot of stuff. A specialty liquour just makes things more fun. You can get fruity flavored things like peach schnapps, or something creamy like Bailey’s Irish Cream (I personally buy cheaper Irish cream because I think they all taste the same). Let me know if you decide to stock your bar! 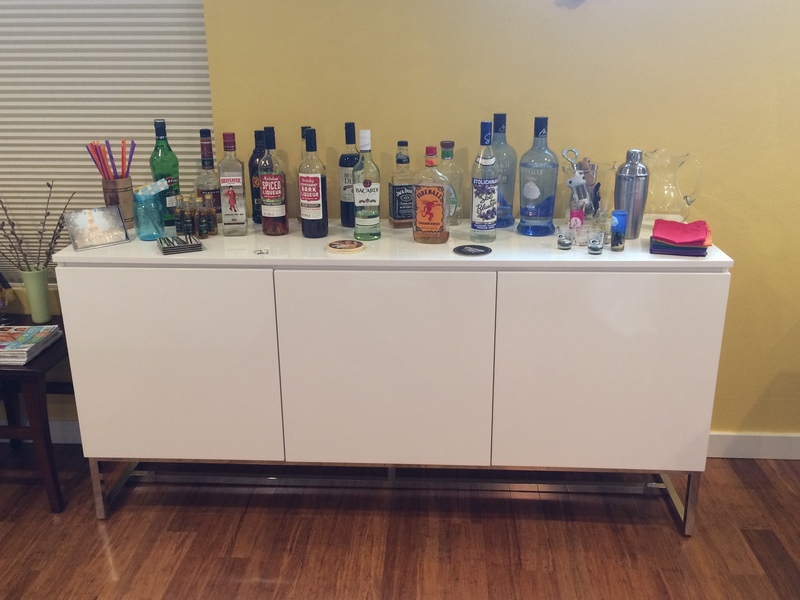 It’s also a really cool idea to have a “stock the bar” housewarming party. Just have everyone bring their favorite bottle and mixer, then you keep what’s left over. Happy mixing! What’s your favorite cocktail recipe? I tried something similar once. I decided it would be a nice thing to be able to offer cocktails to company. I bought a couple of bottles of liquor, intending to add, one bottle at a time, until I had a good, basic bar. Then my brother came over. Ha! My effort to have a bar turned into me keeping brother supplied with his favorite bourbon. Lol. Well… Maybe that is not the bottle to start with 🙂 I definitely run into that. It was inspiring me to make a drink. 🙂 but I resisted! We are hoping to get a bar soon! After the wedding hehe. But we always have whiskey and wine at home. Just in case lol. My favorite drink is simple- muddled lemon, a big splash of whip cream vodka and two cubes of ice. Just telling you that makes me want one. Is it too early for a drink? I love your idea of a stock the bar party **** why didn’t I think of that when we become home owners eons ago ha! ha! We would love a bar but can’t decide on a design (I love your design, but my partner wants the real deal with stools and all) or where to install a wine fridge. This leaves our booze currently kept in a kitchen cabinet with pullout shelves and the never ending wine supply in a beautiful rack in our pantry! Hey, that’s the drink I wrote about! lol! It’s not too early for a drink if we’re in Europe, let’s just pretend. Space was our biggest issue, too. There wasn’t anywhere that J was okay with putting it until we moved to a bigger place. It’s an exercise in self control, even for just me and the hubby!